I congratulate you with all my heart. It is perfectly delightful that the little daughter should have come so promptly to greet you and cheer you, and I share your happiness. I must rush this message off to you at once because my heart was made very full by your letter. 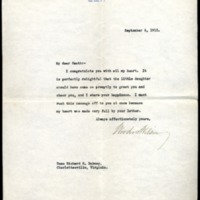 Wilson, Woodrow, 1856-1924, “Woodrow Wilson to Richard Heath Dabney,” 1912 September 6, WWP20469, University of Virginia Woodrow Wilson Letters, Woodrow Wilson Presidential Library & Museum, Staunton, Virginia.